Erin over @ Two Thirds Hazel has been doing these Blogmopolitan quizzes and I think they're adorable. Here's my quiz. I couldn't blog without my computer, and I rely on borrowing my boyfriend's DSLR for photos. So this would basically be a dream come true, wouldn't it?! Such an AWESOME giveaway, girls! Thanks! DSLRs are the best cameras in life! I cannot life without a computer and a cell phone for my job/blog.. I stare at the computer all day long for my job and if it weren't here then I guess I would be hand writing until my fingers fell off. Oh my! I have been lusting after one of these cameras FOREVER! I would be so grateful! Please Miss Rafflecopter! 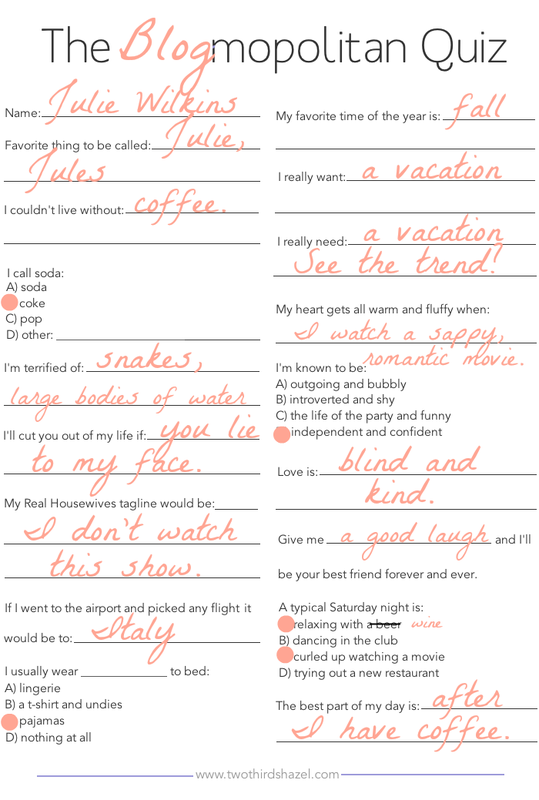 Btw I've been loving your blog and this quiz is too cute! I absolutely agree with you - the best part of my day is after coffee too lol! I love a romantic movie and give me a good laugh and I'll be your best friend too! I love my DSLR I don't know what I would do without it! If I won this camera I would definitely give it to my parents! Thanks for the awesome giveaway! Really and truly it would be hard without my smartphone to take quick pictures! Literally want to win this giveaway soooo much!! Need a new camera asap and would LOVE this. Massive fan of your blog btw! Tools I can't live without... right now my laptop and my iPhone. Hopefully in a few days I will be able to add DSLR camera to the list! I keep checking back to see if the winner has been announced. Sorry, I'm really excited about this giveaway! Do you know when it will be announced?